Nelson Valdez set that up. 61’ - Pretty incredible turn of events. 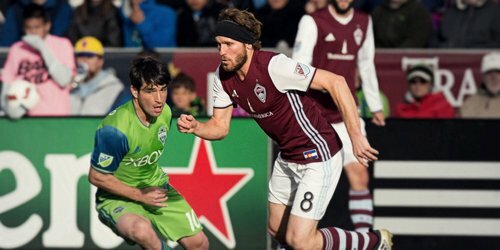 Rapids had the run of play for almost an hour. The Sounders scored on their third (!) shot. - Sounders lead 3-1 on aggregate. 65’ - FREIDOM. Stef plucks a Hairston cross out of the box. Rapids totally desperate for goals now. 68’ - Yellow card for Marc Burch for cleaning out Tye Mears. And Ozzie’s down. 70’ - Rapids going down swinging. Ozzie and Morris both have knee wraps now. 71’ - Schmetz has played this series beautifully, between riding the Valdez train to coaxing width out of JMo to his sub times/choices. 73’ - Ozzie just went down again. Oh dear. 74’ - Marco Pappa on for the Rapids. 75’ - Ozzie’s off. Not great, Bob. Oniel Fisher comes on, assuming Flaco tucks inside next to Roldan. Under 20 to play. @ColoradoRapids need two. 76’ - Frei knocks out a Gashi FK and Torres ushers it clear. Guys. Nerves. All of them. 77’ - Another Rapids FK. Why. 78’ - Gashi’s FK hits the wall (again). 78’ - What even is time, as a concept. 78 minutes could be 90.